Khoshrou, I., Jafari Nasr, M., Bakhtari, K. (2017). Exergy Analysis of the Optimized MSFD Type of Brackish Water Desalination Process. Iranian Journal of Chemistry and Chemical Engineering (IJCCE), 36(6), 191-208. Isa Khoshrou; Mohammad Reza Jafari Nasr; Khosrow Bakhtari. "Exergy Analysis of the Optimized MSFD Type of Brackish Water Desalination Process". 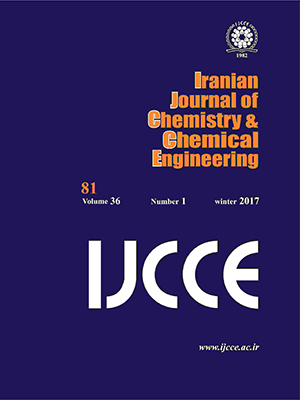 Iranian Journal of Chemistry and Chemical Engineering (IJCCE), 36, 6, 2017, 191-208. Khoshrou, I., Jafari Nasr, M., Bakhtari, K. (2017). 'Exergy Analysis of the Optimized MSFD Type of Brackish Water Desalination Process', Iranian Journal of Chemistry and Chemical Engineering (IJCCE), 36(6), pp. 191-208. Khoshrou, I., Jafari Nasr, M., Bakhtari, K. Exergy Analysis of the Optimized MSFD Type of Brackish Water Desalination Process. Iranian Journal of Chemistry and Chemical Engineering (IJCCE), 2017; 36(6): 191-208. This paper presents a detailed thermodynamical exergy analysis of an optimized MSF distillation plant based on the latest published thermodynamics properties of water and seawater software of the Massachusetts Institute of Technology by using design and optimized plant operation data. Exergy flow rates are evaluated throughout the plant and the exergy flow diagram is prepared in both cases. The rates of exergy destruction and their percentages are indicated on the diagram so that the locations of each exergy destruction can easily be identified. The study concludes that as a result of an optimization, making the MSFD unit once-through cooling system to recirculating type by using cooling tower system, the unit's exergy destruction pattern changes meaningfully. Besides, in the three exist thermal desalination plants up to 53 percent of feed water, i.e. ; 667 m3/h and the same amount of reject water can be conserved. Though, with this modification, the unit steam consumption has been increased up to 13 ton/h, about 50 percent of design. Moreover, the detail of the study showed that the exergy destruction can be reduced more than 39% in the pumps, and 30% in blowdown and around 29% in distillate streams. For brine heater, an enhance as small as 0.37% is also achieved. In the other hand, the rate of destruction of exergy increased around 25% in the cooling process and above 5% in the evaporators. Attia A.A., Thermal Analysis for System Uses Solar Energy as a Pressure Source for Reverse Osmosis (RO) Water Desalination, Solar Energy, 86: 2486–2493 (2012). Li C., "Innovative Desalination Systems Using Low-grade Heat", Ph.D. Dissertation, Department of Chemical & Biomedical Engineering, University of South Florida, (2012). Hermosillo J.J., Arancibia-Bulnes C.A., Estrada, C.A., Water Desalination by Air Humidification: Mathematical Model and Experimental Study, Solar Energy, 86: 1070–1076 (2012). “International Desalination Association (IDA), Desalination by the Numbers”, (website): http:// idadesal.org/ desalination-by-the-numbers/ (accessed February 08, 2017). Sharqawy M.H., Lienhard J.H., Zubair S.M., On Exergy Calculations of Seawater with Applications in Desalination Systems, Int. J. Therm. Sci., 50: 187-196 (2011). Jafari Nasr M.R., Bakhtari K., Khoshrou I., Modeling and Optimization of Cooling Water Consumption in the Multi Stage Flash Distillation Process, Journal of Applied Research in Chemistry, 9(1), (2015). Rasoul M.G., Khan M.M.K., Covey D.W., Solar assisted desalination technology, “International Conference and Exhibition on Sustainable Energy Development”, February 2-3, New Delhi, India (2006). Fitzsimons L., "A Detailed Study of Desalination Exergy Models and Their Application to a Semiconductor Ultra-pure Water Plant", Ph.D. Research, Dublin City University, pp. 55-56, (2011). Tsatsaronis G., Definitions and Nomenclature in Exergy Analysis and Exergoeconomics, Energy, 32(4): 249-53 (2007). “Water Desalination Plant Engineering Book”, Abadan Oil Refining Company, Abadan, Iran, (1980). Al-Weshahi M.A., Anderson A., Tian G., Exergy Efficiency Enhancement of MSF Desalination by Heat Recovery from Hot Distillate Water Stages, Applied Thermal Engineering, 53: 226-233 (2013). Sharqawy M.H., Lienhard J.H., Zubair S.M., Thermophysical Properties of Seawater: A Review of Existing Correlations and Data, Desalin. Water Treat., 16: 354-380 (2010). Uche Marcuello F.J., "Thermoeconomic analysis and simulation of a Combined Power and Desalination Plant", Research Ph.D., Zaragoza University, pp. 409-410, (2000). Nayar K.G., Sharqawy M.H., Lienhard J.H., Banchik L.D., Thermophysical Properties of Seawater: A Review and New Correlations that Include Pressure Dependence, Desalination, 390:1-24 (2016). Massachusetts Institute of Technology, Thermophysical Properties of Seawater (Website): Thermophysical properties of Seawater (Accessed April 15, 2016).